The 5-5 point has occasionally been used as the first play in the corner. The idea was experimented with during the New Fuseki era, often with the intention of forming a three-stone enclosure by adding further stones at the points marked a (pillbox). More recently, 5-5 point openings have been used with success by Yamashita Keigo (especially in the Gosei tournament). Pieter Mioch has a nice introduction to the 5-5 point in part VII of his gentle joseki series. Its direction is clearly towards the center. There are several ways for White to approach it, but the best way is probably not to approach it at all. If White invades anywhere, it is likely that the black stone will get stronger, and because Black has no good point to make an enclosure as well, the best strategy for Black is probably to leave this corner alone, at least during the fuseki. 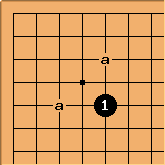 Notice that if White leaves the corner alone, Black can not surround the corner cleanly with a single move. There are not so many chances to see 5-5 patterns in action in pro games. This is from a fun 'even' game between the French amateur 5 dan Frederic Donzet, and Takemiya. Something like this happened, with Takemiya playing a high wedge as a reduction of Black's side of the board, concentrating on getting out to the centre and leaving Black with aji around a. This was played at a party after the 2000 WAGC; the interest is that Takemiya had clearly observed one of Donzet's games using this type of 5-5 opening, and wanted to make a comment in a pleasant way. So Takemiya made a sanrensei against 5-5 points and watched how Black tried to develop them. DaveSigaty: There was an interesting game using 5-5 handicap stones in November 2002 between Kato Masao, Honinbo and Samejima Ichiro, Amateur Honinbo. Here is the beginning of the game. tapir: It is seldom enough to give a list here, isn't it?